Soroptimist | This used to be my second life as a verb. 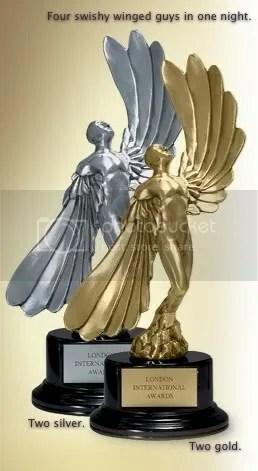 The London International Awards 2007, Or, The Swishy Winged Guys Are Out! This is the only industry trophy that can carry off a fuchsia feather boa. The 2007 LIAA Poster & Outdoor Jury awarded Silver Swishy Guys to the Soroptimist campaign for Poster Campaign, Indoor; and to Soroptimist “Bullet” as a single-entry poster. The Print Jury gave Gold Swishy Guys to the Soroptimist campaign in the Print Campaign Public Service/Social Welfare category, and to Soroptimist “Bullet” as a single entry. Four swishy guys. Unbelievable. They can do-si-do, change your partners, here we go. Check out the LIAA winners in design, digital, integrated, print, radio, and outdoor. If you haven’t seen it yet, AOI’s “Hairy Tale” for Asience Shampoo will raise goosebumps.